Motor vehicle crashes cost Nebraskans approximately $943,674,200 in total damages. About 228 Nebraskans died in motor vehicle accidents in 2017. Last year, almost 17,691 survivors suffered injuries in car crashes. Police arrested 1,802 people for negligent driving in 2017. Serious car accidents can have far-reaching consequences. Victims often need time off from work to recuperate from their injuries. Some survivors sustain permanent disabilities in these accidents; while others develop psychological issues like anxiety or post-traumatic stress disorder (PTSD). Many can’t return to work immediately due to their physical and/or emotional injuries. Some employers may fire victims due to their inability to work. Additionally, survivors must pay for hospital bills and ongoing medical expenses following their accident. At the Robert Pahlke Law Group, we understand the struggles of car accident victims. Survivors deserve compensation to pay for their mounting expenses following an accident. Did a negligent driver cause your accident? Have you suffered serious injuries and property damage? If so, contact us today. Our veteran Nebraska car accident attorneys will work hard to protect your rights. Call the Robert Pahlke Law Group today at (308) 633-4444, or contact us online, to schedule your free consultation. The National Highway Traffic Safety Administration (NHTSA) works hard to prevent traffic-related injuries and deaths. This federal agency attempts to teach Americans how to stay safe on the nation’s roadways, and also encourages individuals to halt reckless behavior that endangers those around them. Distracted driving. Motorists must remain alert at all times and pay attention to changing road conditions. Inattentive drivers may become distracted by cell phones or other electronic devices. Other distractions include passengers, eating, and drinking. Driver inattention can lead to serious accidents. Under Nebraska law, distracted drivers may face criminal penalties. In 2015, the state experienced 4,402 accidents caused by distracted driving, which resulted in 12 fatalities. That year, the number of Nebraskans involved in distracted driving accidents increased by 20 percent. In 2016, the NHTSA reported that distracted driving caused 3,450 fatalities nationwide. Drug impairment. Both illegal and prescription drugs can negatively impact a motorist’s judgment. Drugged driving occurs when an intoxicated driver operates a motor vehicle. This risky behavior puts other drivers and pedestrians at serious risk of injury. According to Pew, deaths in drugged driving accidents have spiked due to increased opioid and marijuana use nationwide. 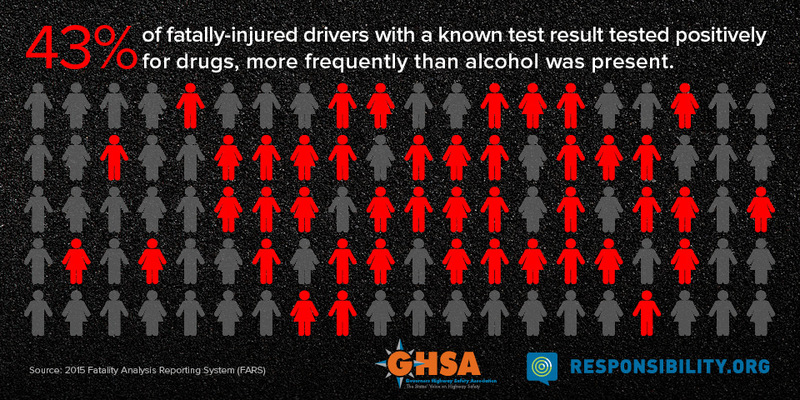 The Governors Highway Safety Association (GHSA) reports that 43 percent of DUI drivers involved in fatal accidents tested positive for drugs. In Nebraska alone, police charged 6,877 people with DUI offenses in 2017. Alcohol impairment. Many drivers throughout the country consume alcohol before they travel, and their risky behavior endangers everyone around them. According to the NHTSA, almost 29 Americans die in drunk driving accidents each day. The agency further reports that drunk drivers killed 10,497 Americans in 2017 alone, which constitutes a 1.7 percent increase from the previous year. Another NHTSA study found that drunk driving accidents cause $44 billion in damages each year. According to NDOT, 1,661 alcohol-related accidents occurred in Nebraska in 2017. Speeding. Nebraska has enacted speed limits throughout the state to help ensure that motorists drive safely. Unfortunately, some Nebraskans ignore these rules and race down highways in icy weather. Others rush down busy city streets at unsafe speeds. This carelessness can cause serious accidents. In 2016, 10,111 Americans died in speed-related crashes, and such incidents accounted for 27 percent of all traffic-related fatalities. Speeding caused more than 516 injury-related accidents in Nebraska alone. Hit-and-run accidents. A negligent driver may slam into another vehicle and flee the scene. The law classifies these crashes as hit-and-run accidents. Nebraska law mandates that any driver involved in an accident must immediately stop and provide his or her information to all other individuals involved in the accident. The state can charge drivers that flee the scene with a Class II misdemeanor; drivers with two or more previous convictions may face a Class I misdemeanor charge. Vehicles roll over. This situation often occurs when a car hits a curb or guardrail. These highway crashes kill hundreds of people every year. Cars crash into stationary objects. These immobile objects may include electrical poles, trees, and walls. A car runs off the road. According to a 2009 NHTSA study, drowsiness, inclement weather, and speed contribute to these types of crashes. A vehicle hits an animal. Head-on collisions. These accidents occur when one vehicle’s front end crashes into the front of another vehicle. Head-on collisions account for 2 percent of the nation’s car accidents. These are high-impact crashes, and most drivers are unable to react in time to stop them. The severe impact of head-on collisions can flip a vehicle and/or crush its chassis, pinning passengers inside. Usually, an intoxicated driver who is traveling in the wrong direction on a road causes a head-on collision. Head-on accidents can cause serious injuries and even death; victims may experience severe injuries that result in permanent disabilities. Distracted driving. Negligent drivers don’t pay attention to changing road conditions. Tailgating. NDOT advises drivers to maintain a safe cushion of space from other vehicles to ensure that they have time to react to emergencies and avoid collisions. Unfortunately, some impatient drivers try to intimidate cars in front of them or pressure other cars to speed up. If the vehicles ahead suddenly stop, the tailgating car has no time to react and will likely crash into the car ahead of it. Panic stops. During these incidents, a vehicle in front stops without warning. A tailing car can’t stop in time and hits the bumper of the front car. Reduced traction due to weather conditions. The Nebraska DMV recommends that drivers reduce speed in relation to road surfaces and weather conditions. Hydroplaning occurs when tires slip on thin films of liquid on a roadway. Motorists should slow down in adverse conditions, but many do not. Drivers often misjudge the length of time and distance that they need to stop in adverse conditions, resulting in an accident. Vehicle rollovers. A study conducted by the Insurance Institute for Highway Safety found that rollover accidents have the highest fatality rates of all accident types. Rollovers occur when a driver loses control of his or her vehicle, and their vehicle slides sideways, hits an object, and flips over. Objects that cause a rollover may include a tree stump, curb, guardrail, or uneven ground. Almost 9.1 million passenger vehicles suffered rollovers in 2010. Such incidents also accounted for 35 percent of car crash deaths in 2010. Clipping accidents. Motorists may clip other vehicles if they fail to check their blind spots before merging into another lane. Clipping accidents can result in serious damages and injuries. Traumatic brain injuries (TBIs). Severe bumps and blows can damage the brain’s functions. According to the Centers for Disease Control and Prevention (CDC), 50,000 people die annually from TBI, and TBIs account for 30 percent of all injury-related deaths. Additionally, a 2013 CDC study found that car crashes caused the most TBIs in people 15-44 years old. Spinal cord injuries (SCIs) and paralysis. Accident survivors may receive catastrophic injuries to their spinal column or nerves. SCIs disrupt the neural network’s functions, causing numbness and, in the most severe cases, paralysis. SCIs can also cause permanent changes in strength and physical functions. According to the World Health Organization, almost 500,000 people will suffer an SCI. The agency also reports that most SCIs are preventable. The U.S. has an estimated 17,000 new SCI cases every year.
. Many survivors suffer from residual pain and permanent injuries following an amputation. Back injuries. Other common injuries that crash victims suffer are back injuries. Typical trauma includes herniated discs and/or fractured vertebrae. Additionally, survivors can suffer lumbar sprains, herniation, spinal stenosis, and degenerative spinal disorders. Bone fractures. Broken bones are common accident-related injuries that can disable victims. Complete fractures may break through the skin. Burns. Fiery car crashes can leave victims with severe burn injuries. This tissue damage can result from heat, chemicals, and other materials. Serious burns are life-threatening, and they can cause blisters, swelling, ruptured skin, and shock. The injuries may also require hospitalization. Crush injuries. A vehicle’s interior may collapse, compressing a victim’s body. Limb compression can restrict blood flow and cause serious damage. This trauma can lead to crush syndrome, and may lead to renal failure, hypovolemic shock, respiratory distress, and heart problems. Disfigurements. Crash victims may also suffer a disfiguring injury during an accident. Some survivors experience a diminished quality of life following the accident due to their injuries. Victims may need to undergo many surgeries to repair the damage. Knee injuries. Victims can suffer a knee injury that leaves them unable to walk. They may suffer a sprain or strain during an accident. Other potential knee injuries include dislocations, fractures, torn cartilage, and anterior cruciate ligament (ACL) tears. Lacerations and bruises. These are cuts, breaks, and openings in the skin. Neck injuries. Severe neck injuries can result from whiplash in a car accident. Victims may suffer acute pain, bruising, and swelling. Common neck injuries include ligament injuries, spinal cord injuries, or herniated discs. Nebraska follows the legal doctrine of modified comparative fault to assess liability in civil claims. This tort rule assigns damages based on a claimant’s level of negligence in an accident. Comparative fault laws distribute negligence based on each party’s percentage of fault. For example, a Scottsbluff jury may determine that a plaintiff was 25 percent liable for his or her accident, while the defendant was 75 percent liable. In this scenario, if the plaintiff wins, the courts would reduce the damages award by 25 percent. The state doesn’t cap economic or non-economic damages in personal injury cases, but victims must file any lawsuit within four years from the date of their accident. At the Robert Pahlke Law Group, we realize that automobile accidents can cause extreme turmoil in victims’ lives. These terrifying incidents may leave people with high medical expenses, and some victims may experience a reduced quality of life due to both physical and emotional injuries. Let us investigate your claim and determine who may be held liable for your accident. Our attorneys work tirelessly to ensure that Nebraska car crash victims get the justice that they deserve. Our firm cares about our clients. While we cannot guarantee a favorable result in your case, we can promise to work hard to secure compensation for the full cost of your injuries. Our law firm works on a contingency basis, which means that we only collect attorney fees from any settlement or damages award that you receive. Call the Robert Pahlke Law Group today at (303) 633-4444, or contact us online, to schedule your free initial consultation with one of our experienced attorneys.